Digitally printed A6, A5 and A4 colour leaflets in full colour using the finest quality smooth white 100gsm paper The process rivals traditional litho, but is a much quicker turnaround for urgent short run leaflet printing jobs needed fast. Order now for despatch or collect from us! Digital leaflets are; DL (99x210mm), A5 (148x210mm) or A4 (210x297mm) and printed on 100gsm digital white or cream paper. We print from your artwork, or we produce professional artwork for you at reasonable prices. The printing of digital leaflets is very fast to turnaround. Digitally printed A5 (148x210) leaflets in full colour using the finest quality smooth white 100gsm paper The process rivals traditional litho, but is a much quicker turnaround for urgent short run jobs. Digitally printed A4 (210x297) leaflets in full colour using the finest quality smooth white 100gsm paper The process rivals traditional litho, but is a much quicker turnaround for urgent short run jobs. How do I pay for digital colour leaflets? You can order using the above button. If you are supplying your own artwork, you will be asked to send us the files as part of the order process. If you have any question please call 01274 792033 or raise a ticket with the Help Desk. Do I need artwork for digital colour leaflets? Yes, you can either supply your own, or we can provide design and artwork for you. 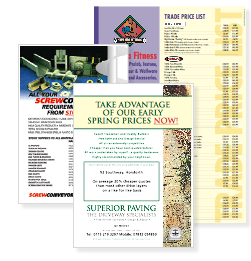 You can look at litho colour leaflets to compare prices. Printline Advertising is a digital colour leaflets printer in Leeds. We have been printing digital colour leaflets in Leeds since 1999. Prices subject to a delivery charge (if applicable) and VAT - E.O.E.